There were monarch butterflies in Canada a couple of weeks ago, probably a fatal place for them to be at this time of year. We wrote recently about this butterfly and its fall migration to Mexico. Monarchs should have left their northern summer homes weeks ago. Stragglers at this time of year are unusual. News of this came from the Associated Press. It quoted a woman at Point Pelee National Park, just across the water from Detroit. She was there to count monarchs as they moved south. She said her tardy butterflies are not alone, other late migrants reported elsewhere in eastern Canada and down the Atlantic coast to New Jersey. Scientists are wondering why this is happening. 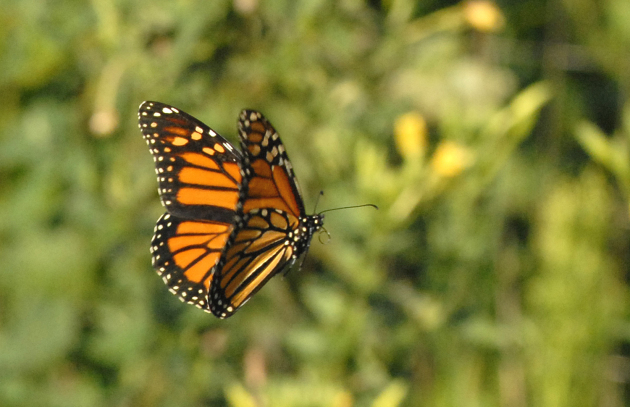 It has been suggested that unusually warm fall weather and strong prevailing winds from the south might have stalled monarch migration. If they don’t move south they freeze or die of starvation. At this time of year the same fate awaits the butterflies even if they head south. They’ll fly into cold weather on a landscape devoid of the flowers they need for food. Speaking of the unseasonal warm weather, a scientist said this is not a particularly ominous sign for the butterflies, since millions are successfully on their way to or have reached Mexico. He said he considers it ominous in general.